Spruce is ranked 711 in the state, 7673 in the nation, by MaxPreps.com. Comparatively, Summit is ranked 76 in the state and 612 in the nation. Spruce has a combined quarterback rating of 53.9, compared to that of Summit’s 107.8 QBR throughout the season. *All-purpose yards include yards gained by the offense, defensive (interceptions and fumble recoveries), and special teams (kickoff and punt returns). Spruce has four sacks all season to Summit’s 14 sacks. However, Spruce does have nine interceptions while Summit has only four. While Spruce has only one defensive fumble recovery, Summit has 10 of them. And while Spruce has just one tackle for loss, Summit has tackled the ball carrier behind the line of scrimmage 53 times this season. Spruce has 176 kickoff return yards and returned two for a touchdown; Summit has 571 return yards and returned none for a touchdown. Spruce has made 50 percent of their point-after attempts, while Summit has made 97 percent of theirs. Spruce has scored 30 touchdowns, 198 points all season. Summit has scored 46 touchdowns, 276 points all season. District 14-5A Champion Timberview (9-1) faces off against Seagoville (8-2) at Kincaide Stadium on Thursday at 7 pm. 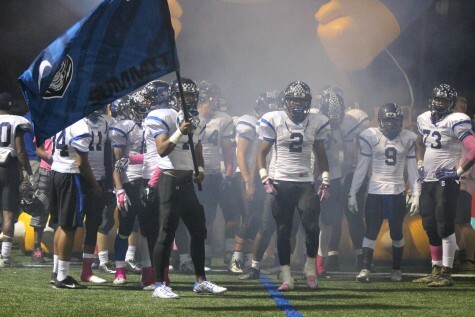 Runner-up Lancaster (7-3) plays South Oak Cliff (7-3) at Midlothian ISD Multi-Purpose Stadium on Friday at 7:30 pm. Fourth Place Lake Ridge (6-4) goes against Kimball (7-3) at the Grand Prairie Gopher-Warrior Bowl on Friday at 7:30 pm.